Grammy Lifetime Achievement Award winner and US folk icon, Tom Paxton, returns to the UK in April 2019 to perform with very special guests, Grammy winning singer/songwriter duo The Donjuans – Don Henry & Jon Vezner. 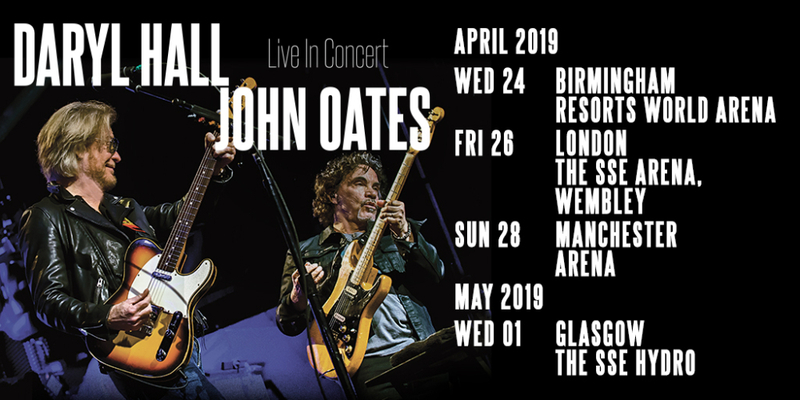 Possibly the greatest duo in the history of rock and roll, the amazing DARYL HALL & JOHN OATES (or just ‘Hall & Oates’ for short) are back in the UK again for a short tour this month- beginning in our beloved Brum at the Resorts World Arena (that’s the NEC to us oldies) on the 24th. Performing a cross-section of hits from right across their 47-year career and beyond, as well as a few hidden “deep cuts” worthy of your attention, the Philly pair are bound to enchant and entrance….and, as if that alone weren’t enough to whet your yacht-rockin’ whistles, support comes from the acclaimed (and thoroughly entertaining) Scottish singer-songwriter KT Tunstall. However, tickets are selling fast, so grab ’em sooner rather than later!! If you wan to find out “how does it feel to be back” and not end up “out of touch”, then get online now and put their “kiss on your list”!! Can you “go for that”? Go on, you know you want to. Just remember- these events start WELL early, and parking and queuing in the area can be troublesome, so get down there at your soonest possible convenience. See you in the aisles!! METAAAAAAAAAAAAAAAAAL!! METAAAAAAAAAAAAAAAAAAAAALLLLLLLLLLL!!!! And, I’ll say it once again in case you didn’t hear me properly the first time- METAAAAAAAAAAAAAAAAAAAAAAAAAAAAAAAAAAAAAAALLLLLLLLLLLLLLLL!!!! Actually, more than that- TRUE metal. PURE metal. And, above all, HEAVY METAL. This, since their formation in 1980, is what New York City’s bravest, boldest and fiercest warriors of the genre have played, fearlessly and without compromise. Oh, for sure, they have at various stages refined and re-defined it with the addition of orchestral and operatic overtones, even featuring at one point guest vocals from the master of all things dark, sinister and ominous, Sir Christopher Lee- but in a career that’s produced thirteen speaker-blowing albums and over thirty death-defying, punishing and above all LOUD tours, vocalist Eric Adams, bassist Joey DeMaio and their assorted bandmates and Brothers have never strayed far from Thee Righteous Path. And now, as they prepare to put their chargers to pasture before making their last voyage to Valhalla, they return for one last time to the English Ground upon which they met, and come to bid the West Midlands- the region that bestowed upon the world such Metallic originators as Black Sabbath, Robert Plant, The Move, Carl Palmer, Chicken Shack, Glenn Hughes, Ted Turner, Judas Priest, Slade, Edgar Broughton, Quartz, Magnum, Possessed, The Ghost, Diamond Head, Witchfinder General and (though the fact is still not popularly known) Phil Lynott – both a respectful homage and a fond farewell by making it the ONLY British stop on their entire tour. And, in return, they hereby invite all True Metal Warriors across the length and breadth of Birmingham, The Black Country, Coventry and the Midlands in general to pay the same respect back by turning up at the 02 ACADEMY on April 19 and April 20 2019 for a night of unsurpassed heaviness and power!! For these shows, consisting of FAN FAVOURITES ONLY, Eric and Joey will be joined by two new recruits to the Court Of The Metal Kings: guitarist E.V. Martel and drummer Anders Johansson, whose thunderous traps of doom will be loud enough to awaken the spirit of Odin himself!! It really doesn’t get more Metal than this. However, tickets are selling fast- so if you want to join the rest of the Brothers And Sisters on their onward march to victory, then act fast and get them now. Remember, when preparing for The Final Battle, there is no course of action but BRAVERY!!! Of course, there is a price to pay for such perfection- it doesn’t come cheap, and that’s why the tickets are priced at £89 pus booking fee. Most have already sold out from LiveNation, Ticketmaster and the 02 site, but don’t despair, keep checking for details: just because you don’t have one already, that doesn’t mean you won’t be able to get in. TRUE METAL WARRIORS NEVER GIVE IN WITHOUT A FIGHT!!! BROTHERS EVERYWHERE, RAISE YOUR HANDS INTO THE AIR- HEAVY METAL OR NO METAL AT ALL!! AND IF YOU’RE NOT INTO METAL, YOU ARE NOT MY FRIEND!! See you down there, eardrums permitting. The velvet voice, the curly-haired crooner, the red rambler, the Boy From New York City. OK, at 77 years of age, Arthur Ira Garfunkel isn’t really a “boy” anymore- but his youthful exuberance, innocent charm and ability to charm audiences worldwide with his way round a variety of tunes- penned by writers as diverse as Clifford T Ward, Sam Cooke, James Taylor, Mike Batt, Jimmy Webb, Van Morrison, Steven Bishop, Albert Hammond, Gallagher & Lyle, the Beach Boys and Osibisa. Not forgetting, of course, the man alongside whom he first made his name- the genius known as Paul Simon, who alongside Bob Dylan and Joan Baez was probably the driving force behind the American folk scene of the 1960s. Granted, old Art’s never been a songwriter per se, but he sure as hell knows how to interpret other people’s- making them his own in the process- and as every single one has a story attached to it somewhere, these are precisely what he’s hitting the UK to tell, promoting his recently published autobiography that also touches on his career as an actor, poet and mathematician. Furthermore, the late 2010s- despite a brief bout of “vocal paresis” some years ago- now find the veteran Artie singing better than he’s done in years. British blues legends SAVOY BROWN- led, as ever, by the irrepressible, ever-youthful Kim Simmonds- will return to The Robin 2 in Bilston once again on April 15 for a spectacular evening of lonesome boogie and classic hard rock. Would you believe that the seminal, phenomenal guitarist/vocalist- born and raised in Wales, “made” in London and now based for many many years in the US- has been leading the legendary combo, indirectly responsible for influencing over half of today’s blues-rock combos as well as the formation of Foghat and other rock gods of yore- for over FIFTY years now? Well, he has- and even at 72, it doesn’t look as if he wants to slow down anytime soon. After all, old bluesmeisters don’t die, they just keep strollin’ that devil’s highway…and let’s face it, they wouldn’t want it any other way!! And nor would we. See you down there for some serious Blue Matter. It’s the tour package every serious progger’s been waiting for for years- former Enid vocalist “That” Joe Payne and the amazing Doris Brendel (last seen up here with Fish, but an astounding singer and songwriter in her own right) in tandem, hitting the clubs and halls of great Britain for a progressive onslaught you’ll never forget. In the true spirit of collaboration, they’ll also be taking it in turns to headline respective gigs- so make sure you get there early!! Best of all, it’s hitting the West Midlands on April 14, when the region’s “home of prog”, the Robin 2, takes its turn at playing host to the dynamic duo. Accompanied by their bands, both acts will be performing their new solo material, plus selected tracks they’ve released with other projects. DORIS BRENDEL is one of the most accomplished and exciting live singers on the scene: apart from her first-class musicianship (and that of her regular collaborator Lee Dunham) she’s also known for putting on incredibly visual shows, with outlandish steam-punk costumes and even laser gloves…. not to be missed! Northampton singer-songwriter THAT JOE PAYNE, meanwhile, is a classically trained vocalist, known for his impressive 5 octave range. Now a solo artist, other projects have included The Enid (2011-2016), Methexis (2015), and more recently John Holden and Zio (both 2018-present). With various collectives he has received 3 Progressive Music Award nominations, including Best Band, Best Album, and Best Event. His personal achievements include being voted Best Male Vocalist for two years running (2014 & 2015) in the Prog Magazine Readers’ Poll. See you down there, motherproggers!! EE BAH GUM!! ABC, those ultra-louche lame-suited New Romantic lounge lizards from deepest darkest Sheffield, are back on tour from April 7 to April 16- performing (once more by public demand) their bestselling Lexicon Of Love album in its entirety. As well as, of course, several other silky-smooth highlights from their glittering career. You never know, they may even play some tracks from their extremely underrated (yet since re-evaluated) second collection Beauty Stab… We can but live in hope. And, of course, he’s right. However, one particular concert- on April 9, at Symphony Hall, Birmingham (home to one of New Romance’s largest and most dedicated tribes, the notorious Darklings) promises to be more special than most. So, if you’re a moody melodramatic Midlander, flop that fringe to one side (assuming you can still grow one, that is) don your most splendid suit and your dancing shoes and don’t be afraid to apply just that tiniest, subtlest hint of pancake and rouge- because after all, where else are you gonna go when the postman don’t call? Tickets are priced at £38, £48, £58, £68 and VIP – £102* adv plus booking fee, from the following link: https://www.thsh.co.uk/boxoffice/ticket/697335 , and are fast disappearing from the box office as we speak!! And yes, once again, the show does start at the (by now infamously, if you’re a regular reader) early time of 7.30 pm. Add and subtract, it’s just a matter of fact, when all’s said and done we still want them back. See you- circumstances permitting – down there.